what about a warrior son for Dong Zhuo ? That's why the game lets you create your own officers. 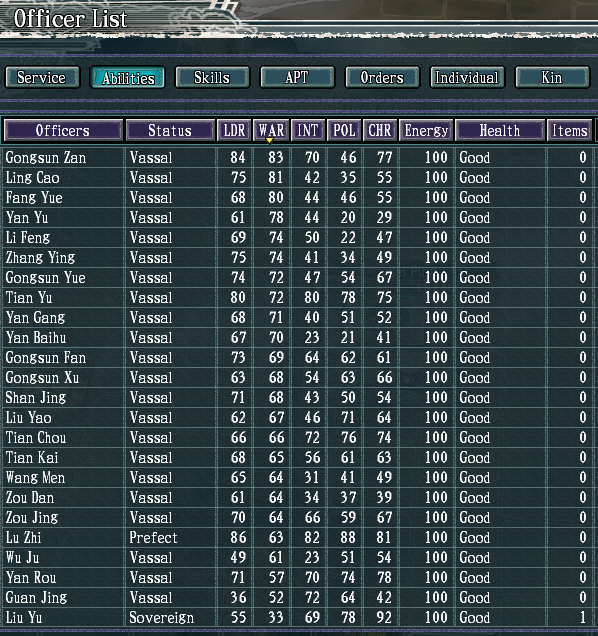 Hello guys, playing as Liu Yu in 190 scenario's here. After a little but struggled being attacked in the first few months by Gongsun family and Zhang Yang family, finally, I can build my own army and make ally with Yuan Shao. I was lucky to be able to recruit Ling Cao and Fang Yue. They are my best fighter for now, lol. In 191, I finally able to conquer the Gongsun family. However, I cannot recruit Gongsun Zan. Is there any negative relationship between Gongsun Zan and Liu Yu? According to Wikipedia, they are not really getting well though. I am okay with altering small hex codes to be able to recruit Gongsun Zan. Is there any hex master here that can see through the mumbo jumbo and help me which hex code that I have to change to recruit him? I would love to use that family as my main force to conquer northern China, and hope that Yuan Shao's and Liu Bei's officer can be recruited. After that the scenario will be a little bit easier. Liu Yu and Gongsun Zan definitely do not like each other in the game, that's why he won't join you, in fact he'd murder Liu Yu if Yu somehow got captured. You could always turn that stuff off in the settings before you play, but if you want to hex edit your actual save file, open it in something like HxD, search for Gongsun Zan and look for the numbers 6a 02 in his code, (just type in Gongsun while your cursor is on the right and it should jump to Gongsun Yue, he is just below that by a couple of officers. Look on the left side with the numbers, below Gongsun Zan's name is his actual data in hex, there should be a string of FF FF with 6a 02 in the middle) if you can find it, change that to FF FF as well, and he will no longer dislike him, and be able to be recruited. So that's why Liu Yu always get killed by Gongsun Zan in my other games. He will only stay alive if Yuan Shao is the one who conquered him. Anyway, amazing response, Valvatorez! I'll check it out very soon! 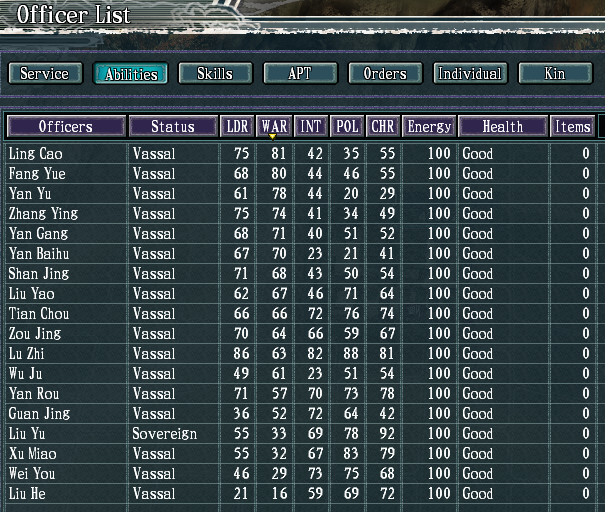 Not the best roster, but should be enough to defend against Zhang Yang and Yuan Shao before conquering Gongsun Du. Also good job, focus on the north first, then eventually you will be strong enough to start going after the southern cities below Ye as well.